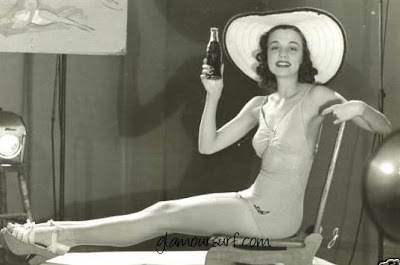 Throughout history companies have used swimsuit clad women to promote their brand. One very well know brand to do this successfully has been Coca Cola. Always youthful, wholesome with a rosy glow these lovely ladies always has a coke in their hands or very near by. 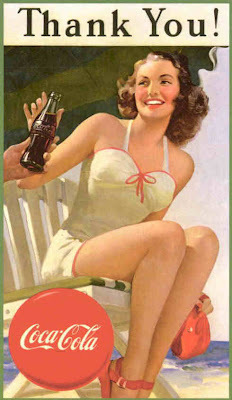 The "Coca-Cola Girl" was the image the company preferred for pitching its potion, from the 1890s to the 1960s. Very rarely did a boy or young man appear in the ads or promotional materials, and after 1930 only in support of the girl. 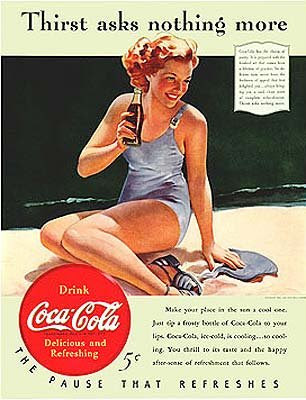 Some very famous artists have created works of the Coca Cola Girl including N. C. Wyeth, Norman Rockwell and Gil Elvgren. 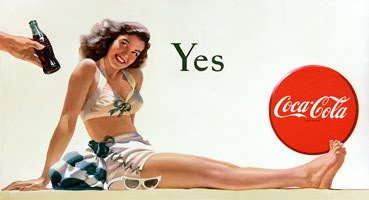 Another artist is Haddon Sundblom who created the Yes Girl Coca Cola billboard and the Coca-Cola Santa. Sundblom was one of Coca-Cola's most prolific artists, painting everything from soda-fountain scenes to bathing beauties. During his peak period in the 1940s, he created at least half of all the Coke billboard art. Photo shoots would be taken and then the artwork would be created. Interesting to note in these images that the swimsuit is by Jantzen. I wonder if they ever did any collaborative work? This video shows some of the wonderful artwork created of the Coca Cola Girls over the years, Things really do go better with Coke. Enjoy. 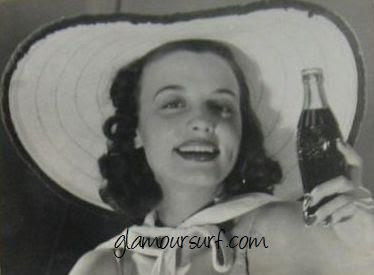 I am looking for a photo of my great grandmother, a 1940's "Coca-Cola Girl", Frances Saucier. My great grandfather saw her on the movie screen while in WWII in Germany, fell in love with her and married her!! If you have any information as to how I can locate this photo of her please send me an email at ginaprosser@yahoo.com.